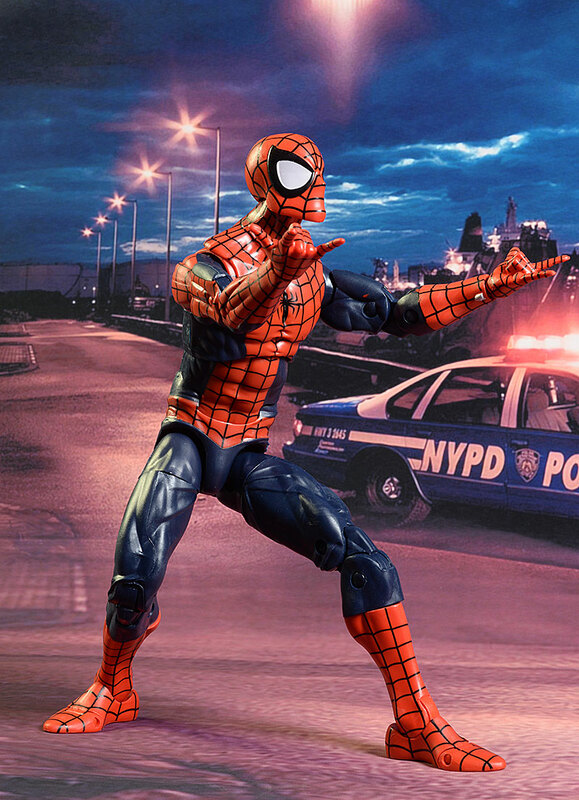 The Marvel Legends series of action figures have been around longer than most toy collectors have been collecting toys. And Spider-Man has seen his fair share of ML versions. 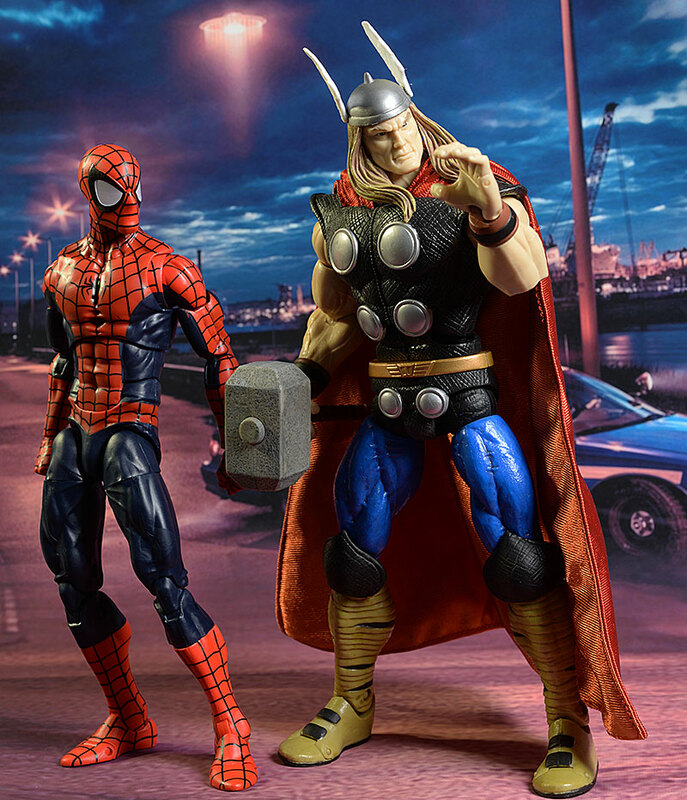 While most people are quite familiar with the 1/12th scale Marvel Legends, there have also been 1/6th scale versions on several occasions, both from Toybiz and from Hasbro...and even as Build-A-Figure extras. Hasbro announced a new series of 12" ML figures recently, and the first two are now hitting stores. I picked up Spider-Man, but Captain America is also available. I found them at Toys R Us for around $50, but they may run a bit higher at some stores. The boxes are very attractive, with some mirrored ink and a completely collector friendly design. You can pop out the figure and accessories without dealing with any twisty ties or rubber bands, and pop everything back later for sale or storage without any damage to the packaging. The back of the box shows off the other figure in this first series, Captain America. He has multiple portraits as well, a big selling point for this new line. 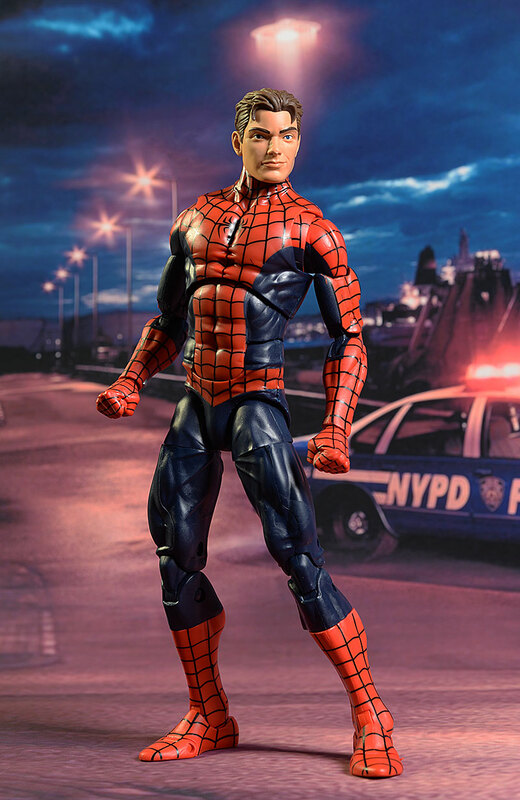 Obviously, this isn't the first 12" Marvel Legends Spider-man, nor is it the first unmasked or half masked version in any scale. 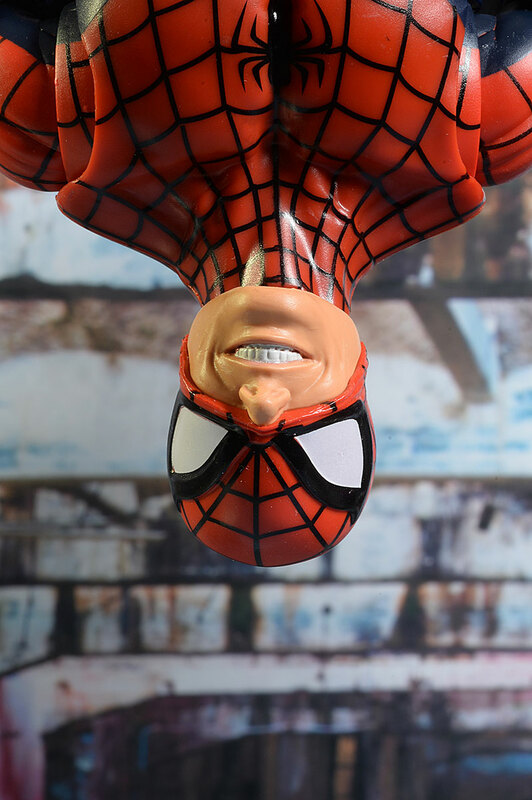 We have had several in the earlier Toybiz and Hasbro 12" lines, including the Icons version, and there have been unmasked and half masked variants in different scales, including the half masked 'pizza' Spidey from the Hobgoblin wave. In fact, this version looks very, very much like the Hobgoblin wave Spider-Man, although I'm not quite ready to call it merely a two up of the earlier release. There are three head sculpts included, and the figure is packed wearing different ones with the other two as accessories. There's the masked head of course, which has a slight texture to it. It seems a tad small to me, but the sculpted eyes and nose look good. The second portrait is a straight up Peter Parker, with a slight smile on his face. 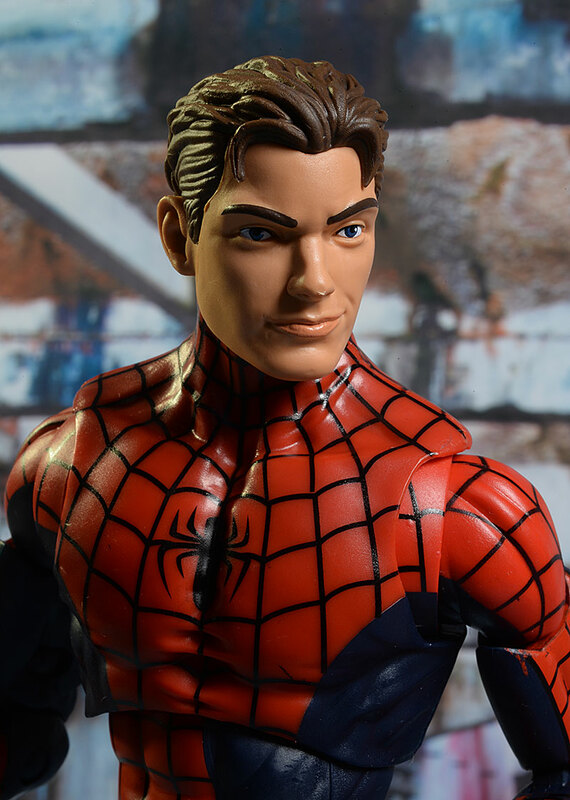 The hair detail is good, and the basic comic book look works, but there is a weird mold line/excess plastic on the tip of his nose. The internal scale looks a bit better to me with this unmasked head in place as well. Finally, there's the half mask face, perfect for smooching on Gwen. Or Mary Jane. Or whomever. This looks suspiciously like the half masked face we also got with the smaller Spider-Man, but the smile does look slightly re-worked. The sculpting on the hands is also quite good, perfect for plenty of different poses. The hands, like the heads, swap easily and with no fear of breakage. 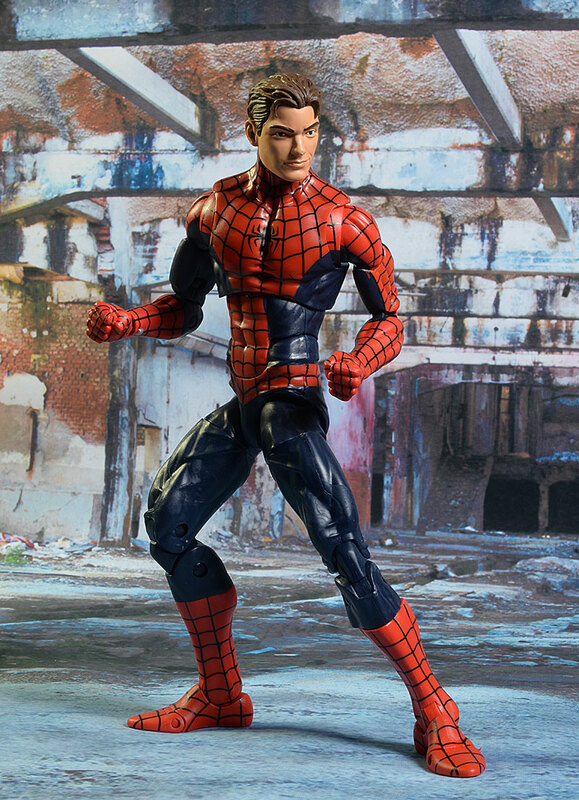 We all know Peter Parker isn't as tall as the other Marvel heavy weights, and this figure reflects that, coming in at just about 11" and sporting a svelte body. There's noting particularly exciting about the paint work, but it's relatively clean for a mass market toy. 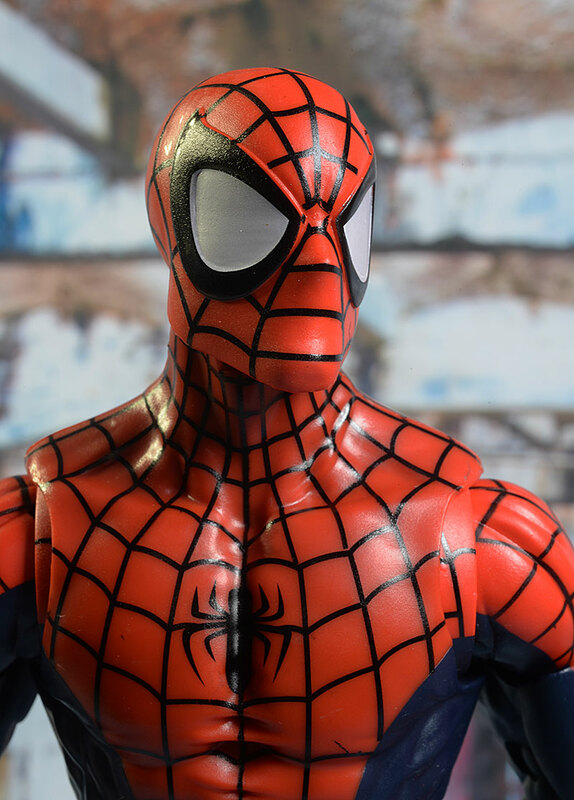 The work on the unmasked head is clean but quite toy-like, and there are the occasional stray marks and edge slips on the overall sea of lines in the body suit. The white eyes look great on both masked portraits, but the white teeth on the half mask face are a bit gloppy. 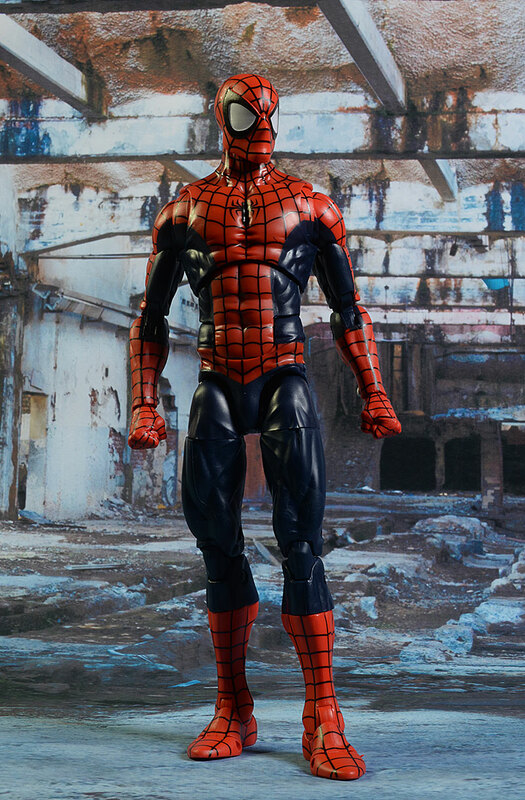 This isn't a high end sixth scale figure - it's a larger version of a Marvel Legends action figure, and as such the quality is quite similar. 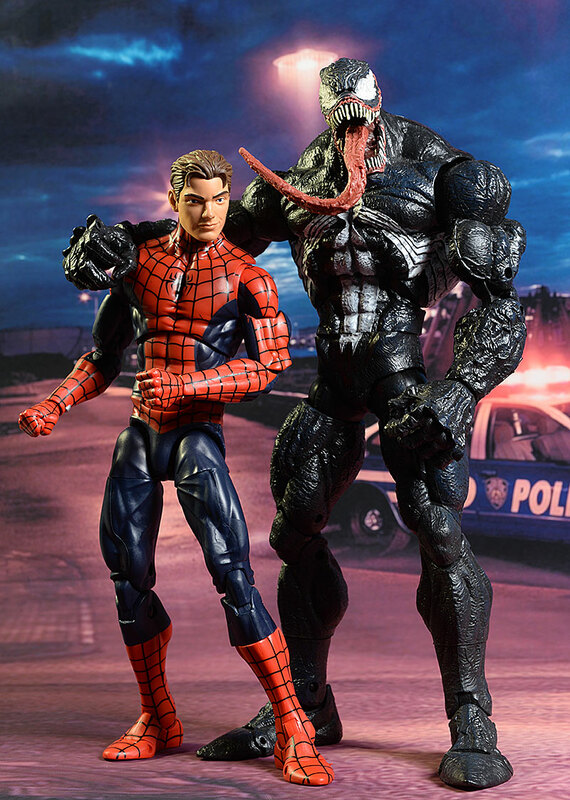 If you have the smaller, recent Marvel Legends Spider-Man, you'll know exactly what you're getting here. There's a ball neck with a hinge at the torso, the very mobile specialized shoulders, cut biceps, double hinge elbows, rotating hinge wrists, a rocker chest that also rotates, an ab-crunch, ball hips, cut thighs, double hinge knees, cut calves, and hinge ankles with excellent rocker movement. There's even a half foot hinge joint, but I was a bit bummed there are no articulated fingers. The joints are all tight, and the hefty figure feels very sturdy and well made. 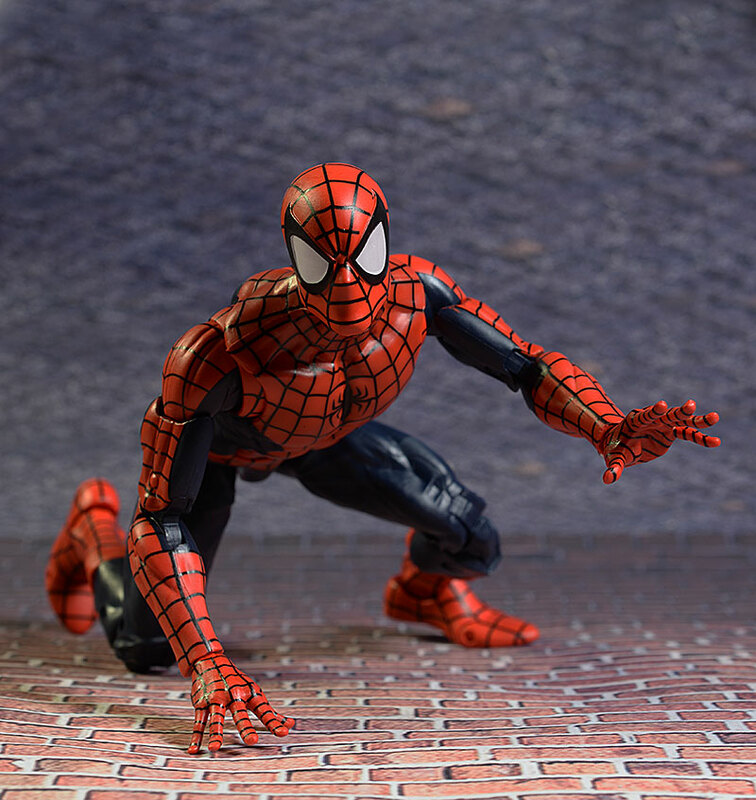 The joints can hold plenty of interesting stances, and while it's not quite as fluid or natural as a high end sixth scale figure, you should have no trouble finding cool poses for the shelf. I already discussed the three heads in the Sculpt and Paint section, and they are a big plus overall for this figure. While I suspect there's some re-use here - or at least some very minor tweaking to earlier portraits - they still add quite a bit of value to the final product. The three heads swap easily enough, as do the extra hands. There are three sets of hands - fists, web slinging, and splayed. You can use them together or in any combination, and the sculpts and scale look great. 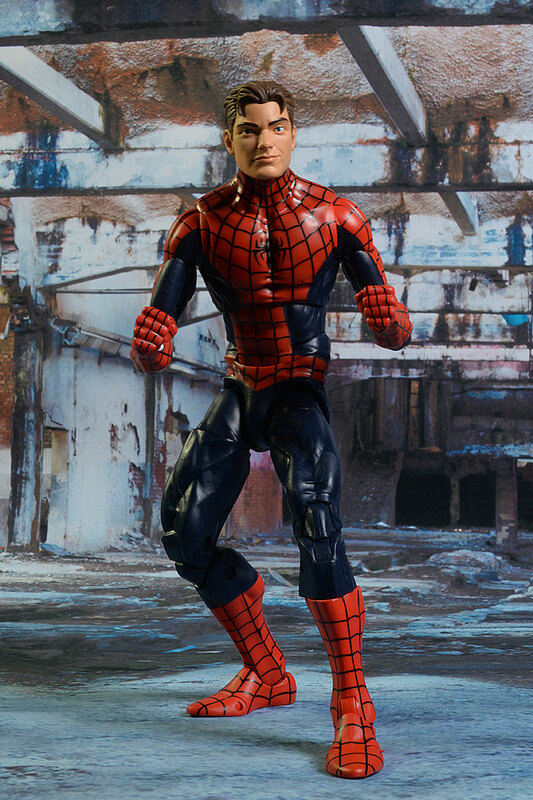 That's it for extras, but I do love those additional portraits...interestingly enough (at least to me), I find the Peter Parker head sculpt my favorite, even though it is a bit out of place with the fully costumed body. Just like their smaller cousins, these figures can be a ton of fun. As I mentioned earlier, the figure are very, very sturdy, and the solid joints work extremely well. You can hand this guy to any 6 year old, and they will have a ball. Or you can give it to an adult collector, and see the childhood glee in their eyes. But here's the killer - at $50 - $60, these are hitting a high mark. 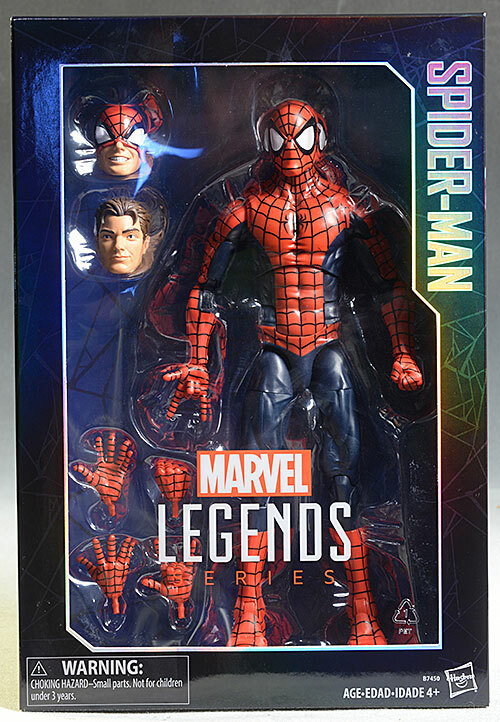 When Icons first debuted about 10 years ago, you could snag them for around $18 or so, the price of a 6" Marvel Legends figure today. I can certainly see a price of $30 - $35 for these, but the Wal-mart online store has them listed at better than $60, and even at $50 - $55, the more likely scenario, its a pretty heavy hit to the wallet. For fans of Marvel Legends, this is a terrific figure, as is the Cap. Well made, great articulation - pretty much an upscale version of the 6" line. However, that price point is going to be tough for many folks to swallow. I know that even though I have pretty much every previously released 12" Marvel Legend, these will be a pick and choose situation for me. I'm betting that ends up the case for most collectors as well. Your best bet right now is Toys R Us, where they are $50, but they should be hitting other mass market retailers soon. Of course, you can search ebay for a deal. I've looked at a number of the old Icons, including Wolverine, Silver Surfer and the Human Torch, Daredevil, Nightcrawler, Dark Phoenix, Collosus, Magneto and Cyclops, Doom and Punisher, Thor, Venom, Spider-man and Beast, and Ghost Rider (with his bike) is perhaps the best that's been produced in the series.